I first demonstrated a formal hand salute to my wife, Lauren, on November 18, 2009, during the Funeral Mass for Michael Lioy. Mike was my father-in-law and was a member of the “Greatest Generation”. Mike served proudly and honorably, although not without his share of mischief, with the 9th Infantry Division during World War II, receiving the Purple Heart after being seriously wounded in combat. So it was that, at the close of his service, I stood before gathered friends and family, called the group to attention and barked, “Present Arms”! When I told my wife what I wanted to do during Mike’s funeral mass, I explained to her that, above all else, rendering a salute is all about respect, whether for seniority, country or flag or, in Mike’s case, for his selfless service to his country…to all of us. I still remember standing on the parade field during drill instruction, with a drill sergeant barking in my ear about getting my salute just right. It takes some practice. But, get it I did. Since those early days, I have rendered a hand salute far too often to count. But the times a salute has been most memorable to me are those times I rendered one out of total respect…at Mike’s funeral mass…meeting President Reagan for the first time…standing at a makeshift memorial at ground zero shortly after 9/11…standing in front of the Wall. I also remember breaking the rules regarding rendering a salute. During a trip into East Berlin decades ago, I passed a senior Soviet officer while in uniform. At the time, Berlin was still an occupied city and thus, as two of the occupying powers, America and the Soviet Union were allies. As such, I was required to render a salute to a senior allied officer. Brash and cocky, I deliberately failed to do so. I lacked the requisite respect, at least in my mind. Saluting is not about rank, not really. 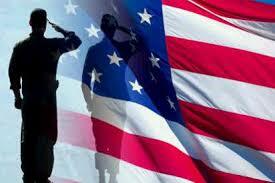 It is a privilege to render a salute, and an honor to do so, showing respect to another person. An example of this point is that, if a member of the armed forces is court-martialed and punishment is rendered, including imprisonment, that person loses the privilege of saluting. In my mind, given that the Soviet Union had sworn to destroy America, I didn’t think a salute was appropriate. Forgetting, for the moment, all of the rules about when a member of the uniformed services must salute, at its heart, a freely offered salute is only about respect. That one true meaning of a salute could not have be any more vividly appreciated than by watching Senator Bob Dole, himself a member of the Greatest Generation, salute his friend and comrade in arms, President George H W Bush. His salute was as telling as it was moving. President Bush is clearly deserving of our respect. Born into privilege, then 18 year-old George Bush likely could have avoided service. Many privileged men, before and since, used their wealth, their status, their station to stay out of uniform. Yet, Bush voluntarily enlisted in the U.S. Navy on his eighteenth birthday, immediately after he graduated from high school. He was commissioned as an ensign on June 9, 1943, just three days before his 19th birthday, which made him one of the youngest aviators in the U.S. Navy. Following his wartime service and after graduating from Yale and after a successful business career, George H W Bush once again offered his service to America, a country he loved so deeply. He served as a member of the House of Representatives, as Ambassador to the United Nations, Head of U.S. Liaison Office in China, Director of Central Intelligence, Vice President and President. His legacy will live with America for years to come. The timing of his passing has added to that legacy. His death, while creating a deep sadness for his family, reminds this nation of what selfless service means. He reminds us of what it means to be a true fighter, yet maintain the compassion, the grace, the kindness that must endure if we are to sustain our humanity. Seldom have we seen a life of service that is his equal. Seldom has a President been more deserving of our respect. Ladies and gentlemen, “Attention”! “Present Arms”!